Very accurate, 100% editable in Illustrator or editable PDF vector formats. You can choose which layers are required and turn on or off, customise all map elements, lines, fills and editable font text. Use as is or add other information to create your own image. ROYALTY FREE. Up-to-date, detailed coast, boundaries, rivers and lakes, 100% editable layered vector map. Suitable for use up to almost any size. All text is editable font text. 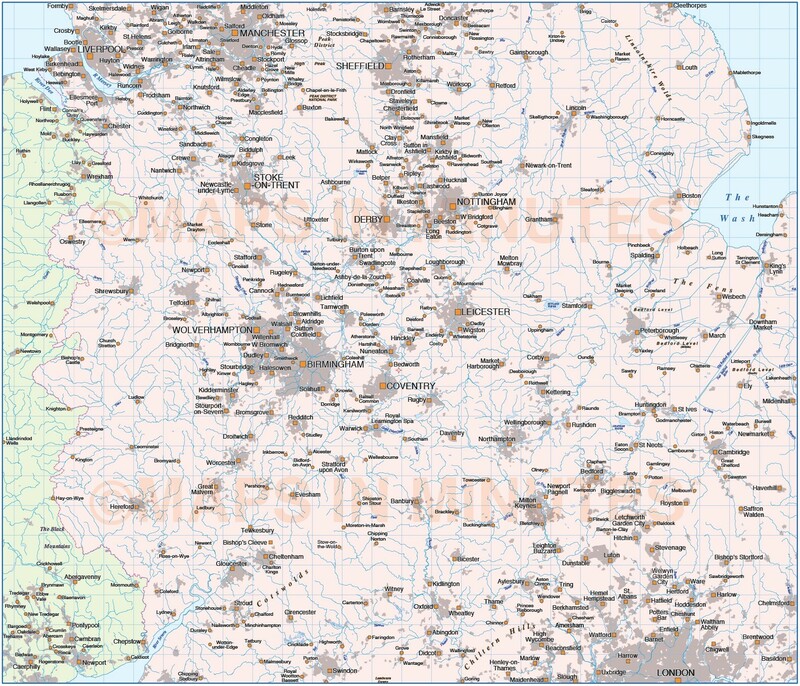 Matches Ordnance Survey data and co-ordinates. 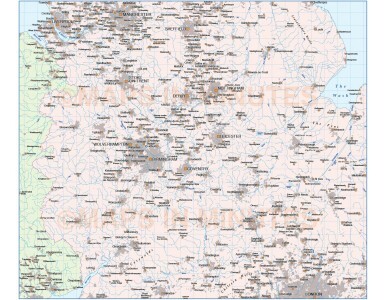 Contains national boundaries and fills as separate elements which are 100% editable. Layers include: Coastlines, country boundaries, country fills, settlements layered by population. Physical features include rivers and river names, lakes and lake names, island, bay and headland names. Authors notes: This map has been completely re-drawn for 2014. We do not just export GIS data to Illustrator and sell it on, we hand draw every line and carefully place every piece of text, even on our simplest maps. It is very accurate having been drawn based on OS data and the area coverage has been increased over the previous Central England edition. All coastlines, boundaries, rivers and lakes are also now at a much greater detail than any previous editions.